Ruger model Mark I semi-auto pistol chambered in .22 LR, manufactured in 1975 This 44 year old Luger style Ruger came to us in great shape. Condition is excellent, with only minor wear. Noticed some light scratches by the take down lever on the back of the grip - see pics. Test fired fine; cycles well and has a bright and shiny bore with great rifling. Not seeing much age at all in the finish; still bright with no rust speckling. The barrel is 6 7/8" long, and is what I'd call a heavy taper. Rear sights are adjustable. Comes with one 10 round magazine. 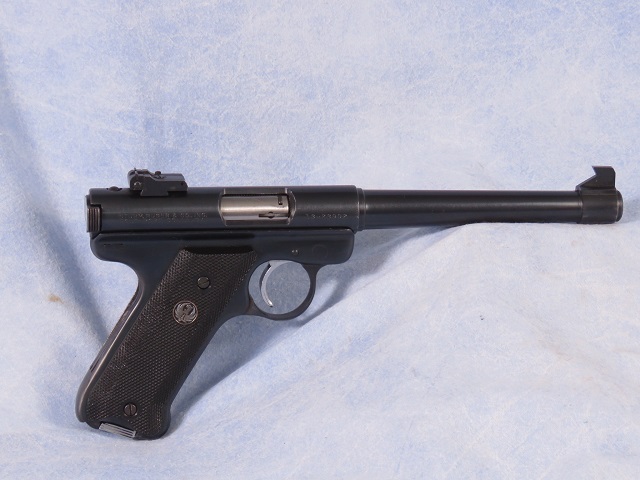 Don't miss this nice Ruger collectible. Barrel Length - 6 7/8"